Frog-related storage - that's all I was looking for last night. 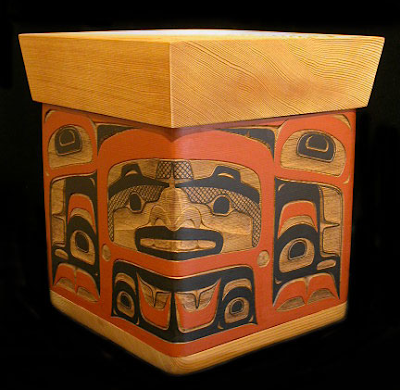 And along the way I stumbled on bentwood boxes by the Native people of the Pacific Northwest. Wow! The first box I found was the one shown above, by artist Dennis Allen. It's for sale from Arctic Raven Gallery for $980. Which raises the point: Yes, most of these boxes are expensive - they are amazing works of art, not simply storage. 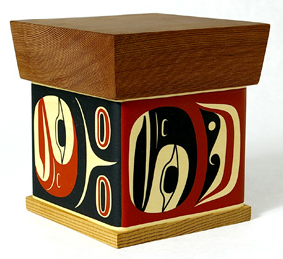 But artist James Michels sells some of his painted (rather than carved) bentwood boxes on Etsy for $150. You can also see his work on his own web site, at Spirits of the North, Tribal Spirit Gallery, and at the Lattimer Gallery. The box above comes from Lattimer and costs CDN $400. 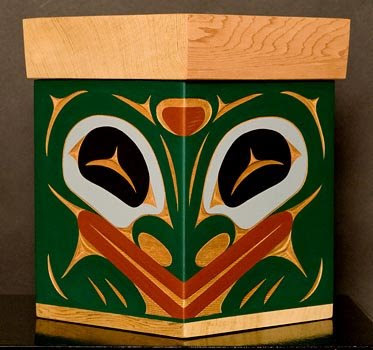 The Lattimer Gallery has bentwood boxes by a number of other artists, including Jim Charlie, Geoff Greene, Rod Smith, Steve Smith, and Chester Patrick. That's Steve Smith box above, with a price tag of CDN $700. The Lattimer Gallery also has one of the less expensive pieces I've seen by Bruce Alfred. You can also see Alfred's work at Spirit Wrestler Gallery, Coastal Peoples Fine Art Gallery, Just Art Gallery, and Spirits of the West Coast Art Gallery. The box above comes from Coastal Peoples and costs CDN $1,400. 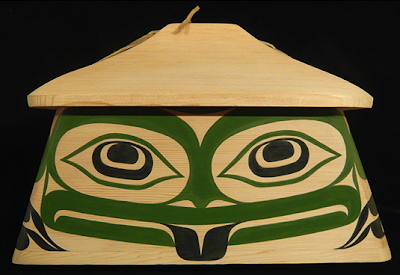 Coastal Peoples also carries bentwood boxes made by Joseph Campbell, Troy Bellrose, and Ken Humpherville, priced from CDN $800 and up. The most expensive is this lovely box from Humpherville, at CDN $3,700. 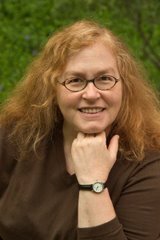 You can also see Humperville's work at Stonington Gallery. 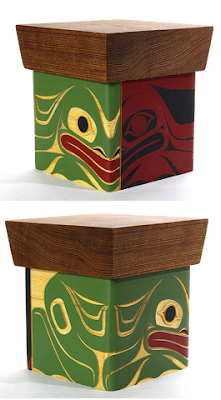 Taking another big step up in price, there's this box by Klatle-Bhi at the Inuit Gallery of Vancouver. Price? $8,500. 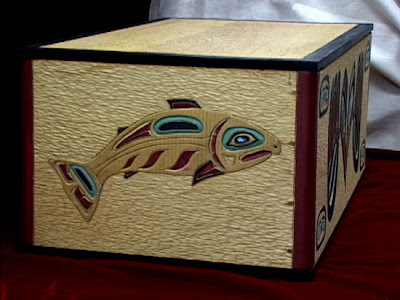 And topping them all, at $10,000, is this box by Walter Bennett at AlaskaNativeArtists.com. Click through to see some of the incredible detail on this box. Finally, I just have to show you John Marston's work, from Alceringa Gallery. 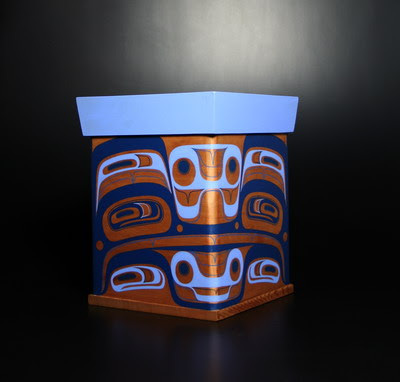 This bentwood box (and all the others they show by him) have been sold, this one for $9,000. Louise, I'm glad to know someone else admires them as much as I do! Want to Stop Getting all those Phone Books? Now Where Did I Put that R2D2 Cake Pan?